From the pages of comic books to the big screen, the Daisy Red Ryder is an all-time classic. With its solid wood stock and forearm and lariat ring with a leather thong, the most popular BB gun in the world remains faithful to its original design. This 650 shot carbine is the spitting image of the one you cherished growing up and its legendary status continues to grow. Remember your first airgun? The excitement. The pride. The fun. For millions of today’s shooters the name on that first gun was Daisy. Today, we’re still the first choice when it comes to introducing a young shooter to airgunning. Simple, easy-to-use designs. Safety features built-in. Ideal for developing shooting and marksmanship skills–Daisy covers the beginner airgun market like no other. For 125 years, Daisy Outdoor Products has been teaching America to shoot safely. Our brand is woven through generations of the fabric that makes up this great nation we all call home. 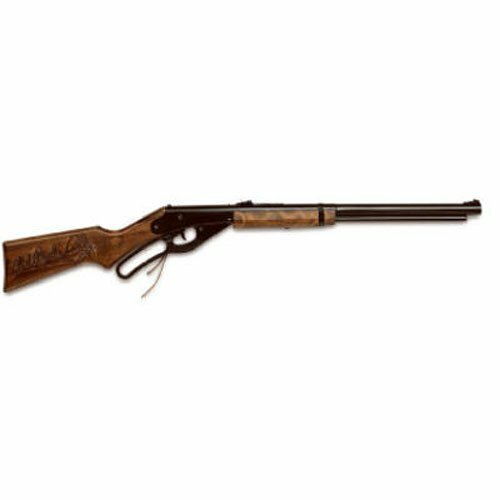 From the most recognizable of all our products, the Daisy Red Ryder and the Model 25 Pump, to our line of quality affordable adult PowerLine Rifles, such as the Model 880, our brand evokes memories of responsibility granted, lessons learned, fun times shared with parents and grandparents and most of all the beginning of a lifelong enjoyment of the shooting sports. Daisy Outdoor Products is the world’s oldest and largest manufacturer of air guns. Daisy’s brands include Daisy, PowerLine, Winchester Air Rifles and AVANTI training and match competitive airguns and Precision Max ammunition and accessories. It all starts here, with a Daisy. Take Pride. It’s a Daisy.